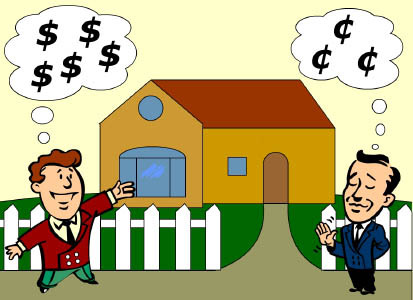 Bernie Kroczek Real Estate | Why your home is not worth as much as you think it is! Let’s face it everyone, including real estate agents, think their own home is worth more than it really is. Not only do we think our own home is worth more than it really is when we come to sell it, but also our car, our TV, our fridge and the list goes on. This is known as the theory of “optimism bias” and basically it says that our own chances of receiving positive things in life are greater than those of the average person. Conversely our chances of experiencing negative things are less that those of the average person. In addition this theory says that “people often demand more to give up a thing that they would be willing to pay to acquire the same thing”. If we apply this theory to the sale of real estate the implications are obvious. It is more common than not that as sellers we perceive our own property to be worth more than what is reasonable, well informed buyer is willing to pay. This is the single biggest impediment to the sale of a property and the main reason properties stay on the market for months on end before attracting an offer or being taken off the market due to lack of interest. This phenomenon, also known as the ‘endowment effect’ is responsible for sellers, in a normal market, over valuing their properties by around 12% or more, according to Richard L. Peters in 2008. Peters cites a study carried out at Stamford University in 2008 which connects the ‘endowment effect’ and the activation of the brain’s anterior insula. The interesting thing is that the anterior insula also activates when the subject experiences fear, pain or disgust. The upshot is that a person selling a home at below their own perceived value of it’s worth will experience psychological affects similar to fear, pain and disgust. Hence the reason what so many properties stay on the market for longer than is necessary, anything to avoid psychological pain. Eventually meeting the market becomes the least painful option as the stress and financial cost of having a property on the market for months on end becomes too much to bear. By knowing about the ‘endowment effect’ and how it influences our perceptions in terms of the value we place on our own property, we may be able to see things from a slightly different perspective and so avoid the unnecessary pain of a long and drawn out selling process, not to mention the financial cost. The information in this article was taken from a piece in Property Observer on October 18, 2012 written by Brian Caldwell-Eyles. If you’d like a copy of the original article please email me at bernie@berniekroczek.com.au.